Apple Thoughts: Bubble Your Way to Word Mastery! Bubble Your Way to Word Mastery! Fun game for kids as well as adults. Can only silence Smartygills, cant get rid of him/her. Summary: I wasn't sure what to expect with this game, because at first glance it seems to be a game more suited to children. However, I found that it is actually challenging, educational and a fun game for both adults and children. There are a lot of games in the iTunes store, and to be honest this one is a pretty basic one. But I think that this benefits the game. They manage to keep it fun and simple, yet challenging at the same time. 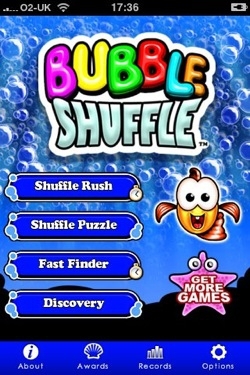 Figure 1: The opening screen welcomes you with Smartygills as your host and helper. There are four games total, two of which are timed, but all follow the same basic goal. 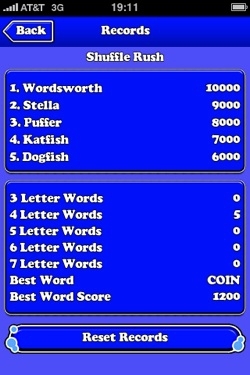 Your objective is to find as many words as possible from a list of letters. Sound simple? I thought so too, but it is surprisingly difficult as you progress through the levels. You can also get more info about the game from here such as looking up your records and awards, and changing the sound options. I'm pretty sure as you play this game you will want to visit the options screen to fix your "helper" Smartygill. But more about that later, lets get on with the game! Figure 2: The game screen with your new friend Smartygill. Regardless of the game you choose, the screen is basically the same. 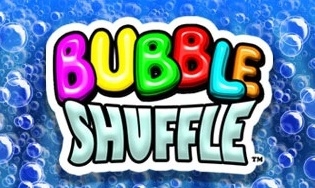 The letters are suspended in bubbles as if you were underwater, and adding to the effect is your helper, Smartygills. He (or she, hard to tell) is a talkative fish that is available to give you hints and encouragement as you navigate this underwater word game. 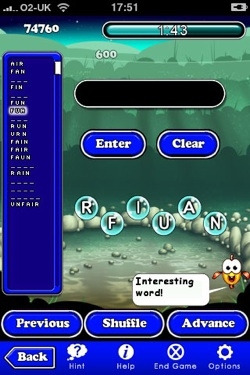 One tip that isn't clear is that you need to hit the shuffle button to clear the text from Smartygill each time he talks, in order to get to the actual game play (or progress through the game screens). Then it is as simple as touching the letters in the order you want to spell out a word, or alternatively drag them up to the blank field above the enter/clear buttons. Once you have your word in the field, hit the enter button to see if you are right. Each time you get it right, the word is added to the list on the left screen, but be warned the letters are tiny. The previous button loads up your previously entered word to adjust it for the next one, and the advance button will take you to the next level. Next level is automatic once you fill out all of the words, but you can advance manually, if you are stuck, as long as you have found at least one word using all of the available letters. One great feature is that if you have to leave the game, hit your home button on the iPhone and it will save the in progress game for you, prompting you when you return to the game later. Want to know how you rate? Go to the main screen (figure 1) and you can access the awards and records your spectacular grasp of the English language has earned you. 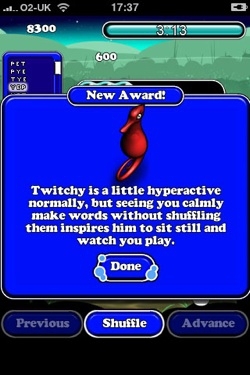 Figure 3: Keep playing and you too can earn an award! You can also check out your records. From the main screen in figure 1, you can hit the awards button and see how many of these creatures you have earned. You can also check out the records you have set for each game in a variety of ways: number of 4 letter words you found, best word, best word score and so on. While I am not too interested in this, my 11 year old might like to rub it in that he has received a Twitchy and his big sister didn't, bragging rights FTW! One of the annoyances for me in this game is Smartygill. He is cute at first, and I can see the draw for kids, but after awhile I just want to play the game without his narrative. Luckily you can shut down the sound in the options screen. Figure 3: The options screen to mute your new friend. Unfortunately you cannot shut down Smartygill completely, only mute him. He will still be present in the games encouraging you with his text messages that you have to cycle through before you continue, so I wish there was a way to shut that off completely. In the initial stages it is helpful, but once I learned the basics it became more of an irritant than anything else. Of course my kids thought he was cool and didn't mind a bit. The extended dictionary contains obscure words and is turned off by default. It will still recognize them if you enter them, but it won't require you to find them to move on to the next level. 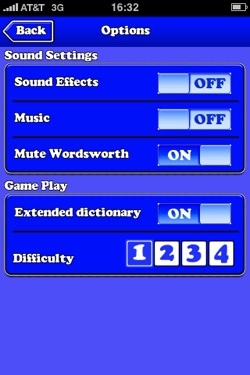 You can also set the difficulty level, which goes up to level 16, which gives you 7 letters to use and each word must be a minimum of 4 letters. The difficulty level progresses automatically as you complete levels so you can also let the game do this for you, which is a nice feature. Overall this is a fun game, and despite the annoyance I had with the host Smartygill, it is still very playable and challenging. The best part? They have reduced the price for a limited time and its only $0.99 USD, available now in the iTunes store. Jeff Campbell is a fan of all things Apple, an X-boxer and geek. He works as a floor supervisor in a 911 Center in the Portland Metro area, and lives in a small town just south of Mt. Hood with his wife, two kids and the required two dogs.